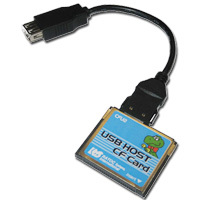 CFU2 provides an USB1.1 Host downstream port with your PDA. Enables you to enjoy various USB HID, Mass Storage devices and HUB with your PDA. You can treat big data, watch movie, listen music on your PDA. ROHS Compliant. The transfer rate is much slower than other PDAs. Refer to the FAQ about the transfer rate. Need to use "Polling Mode" driver in "POL"folder(rev1.0) or "HX2410" folder(rev1.1 or later). hx2410 PocketPC 2003 SE Need to use "Polling Mode" driver in "POL"folder(rev1.0) or "HX2410" folder(rev1.1 or later). hx2790 Windows Mobile 5.0 Problem with Suspend/Reume. To workaround, turn on wireless function. iPod® is a trademark of Apple Computer, Inc., registered in the U.S. and other countries. Windows®, Microsoft ActiveSync®, Pocket PC 2000®, Pocket PC 2002®, Pocket PC 2003®, Windows Mobile 5.0® and Windows Mobile 6® are registered trademarks of Microsoft Corporation in the US and other countries. All other products, services, names and registered trademarks are trademarks of respective companies.